Any time the spinal cord is involved in treatment or surgery there remains a possibility that the paralysis could be a complication. Whether it is an inherent risk of a procedure or results from malpractice depends on the circumstances of each case. Any time a surgeon is operating at or near the spinal cord, spinal cord injury is possible. Depending on the standard of care in the medical community required for an operation, if the surgeon negligently causes spinal cord damage, a malpractice claim is a possible consequence. If that happens, the client will need an experienced malpractice lawyer who not only understands medicine but also has the ability to obtain expert witness testimony that will convince a jury of the malpractice committed. A quadriplegic or paraplegic likely will have a diminished life expectancy. If that occurs, the experienced malpractice attorney needs to make sure that all future contingencies are considered. 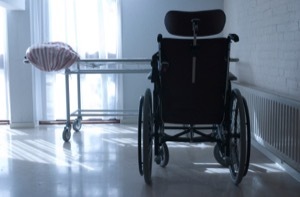 Often, catastrophic cases involving paralysis also require an experienced medical malpractice attorney to consider a future life care plan for the injured party. Statutory caps on damages in Maryland only cap the non economic damages such as pain and suffering. In the event there are future medical bills, future health care needs, future housing needs and the like, these damages are not restricted by damage award caps in Maryland. Paralysis is the complete loss of muscle function of one or more muscle groups. Paralysis can cause loss of feeling or loss of use in the affected area of the body. Paralysis can be caused by damage to the central nervous system or brain. A Spinal cord injury is usually the main cause for paralysis, such as a broken neck. Some other causes are nerve diseases and autoimmune diseases. Paralysis happens when there is something wrong with the messages that are being sent between your brain and muscles due to severe nerve damage. It can occur on one or both sides of your body, or it can be widespread. Paraplegia is the term used to describe paralysis of the lower half of your body, including both lower extremities. Quadriplegia refers to paralysis of all of your extremities. Since many cases of paralysis are caused by spinal cord injury, it is important to know some information about the spinal cord. The spinal cord and brain make up the central nervous system, which controls most of the functions of the body. Spinal cord injuries often begin with a sudden, traumatic blow that break, dislocate, crush or compress one or more parts of your vertebrae, which are some of the bones that make up the spine. Some of the damage or side effects my not occur until some time after the actual injury or event because the side effects of the injury (swelling, bleeding and inflammation) in and around the spinal cord may take time to develop. Some causes for this type of injury include but are not limited to: a car or motorcycle accident, intentional action, a recreation or sports injury, a bad fall, a disease, or a medical mistake. The damage is frequently caused when pieces of the bone or disc touch the spinal cord or press down on the nerves sufficiently. These nerves then cannot perform one of their essential functions (carrying signals to different parts of the body, including the brain). In a complete spinal cord injury, the spinal cord can not relay messages below the level of the damage, which results in paralysis. This causes total or near total loss of motor function and sensation below the level of injury. For instance, if the injury happens near the top of your vertebrae (like a broken neck), the patient is at risk for full paralysis of both arms and legs, which is called quadriplegia. If the injury occurs below the neck and does not travel upwards but the legs are paralyzed, it would be called paraplegia. There is also a partial spinal cord injury which is sometimes called an incomplete injury. In this type of injury, the spinal cord is still able to convey some messages to or from your brain. If this happens, the patient can retain some function below the affected area. Finally, there is also non-traumatic spinal cord injury which can be caused by arthritis, cancer, blood vessel problems, degeneration of the spine, inflammation, or infections. Some signs and symptoms of spinal cord injuries include but are not limited to the following: pain, loss of use, loss of sensation (feeling heat, cold, and touch), loss of bowel or bladder control, vertigo, loss of consciousness, and respiratory difficulty. Although spinal cord injuries usually happen due to an unexpected accident, there are certain people at higher risk for spinal cord injury. Obviously, people who are active in certain athletic activities like football, wrestling, rugby, gymnastics, skiing, diving, surfing, and hockey are at higher risk. In addition, people with certain conditions like osteoporosis and arthritis are predisposed due to their fragile bone and joint functioning and are at higher risk for sustaining a spinal cord injury. People who suffer from a spinal cord injury are faced with many challenges in life. Aside from the complication of adapting to life with a disability and being in a wheelchair, there are many emotional and physical challenges that will occur as well. Life will ever be the same if they become paralyzed from a spinal cord injury. Among the things that will change will be personal relationships with people, professional life and financial situation, as well as day-to-day routine. Although many things will change as a result of such an injury, one learns how to cope with the challenges and obstacles. For instance, some people suffer from urinary and bowel problems due to the sensitivity of the area affected by the injury. Pressure sores, also known as bed sores, can be a possible side effect because spinal cord patients are not as mobile as they once were. Also, inactivity for long periods of time can decrease blood flow through veins and lead to blood clots which can possibly cause a pulmonary embolism (blocked pulmonary artery in your lungs) and/or deep vein thrombosis (a blood clot develops in a vein deep within a muscle)- either of which can be life threatening. People with spinal cord injuries usually need medications or special devices to prevent blood clotting because of their inactivity. Other complications include muscle spasms, respiratory problems, weight control issues, sexual dysfunction, and pain. Over half a century ago, spinal cord patients did not have many options for treatments and many of those patients often died as a result. Cutting edge technology and advances in medicine have given new hope to patients who suffer from spinal cord injuries, and for doctors treating those patients. Rehabilitation, physical therapy and special treatments allow patients with these injuries to lead productive, meaningful, and independent lives. Although there is no present way to reverse the damage that is done to the spinal cord, patients spend less time in the hospital today because of new technology and medical treatments available. Aside from emergency medical response teams providing urgent care, some other steps that medical personnel might take are: administering medications, immobilizing your body, and even emergency surgery. Spinal cord patients require ongoing care and rehabilitation in order to develop fine-motor skills and regain the muscle strength that was lost. During rehabilitation, therapists will also have the patient practice using devices that will help them in the future, such as wheelchairs and prostheses. The main goal of physical therapy is to give the injured person the greatest mobility, strength and independence so that they can try to live on their own without constant help from a family member or nurse. Furthermore, a doctor might prescribe medications to that person if they experience pain or are having trouble with muscle spasms, or urinary and bowel problems. New technologies such as modern wheelchairs help patients recover faster. Also, patients have the option of using certain computer devices that can help with daily activities such as answering the phone and even bathing. Finally, some patients use electrical stimulation devices and neural prostheses which basically use electrical stimulation to produce actions (a computer controlled electrode is usually taped to the skin or implanted under the skin and controlled by the user). Although these devices still being greatly researched, many patients are interested in using them because they allow patients to use parts of their body where they previously lost function. Overall, patients who suffer from paralysis or spinal cord injury have more hope today than ever before. With a positive attitude and willingness to self help by doing rehabilitation on a consistent basis, that person may be able to regain some of the muscle strength and get back to a daily routine without the help of a medical professional or family member. Research is being done every single day in the area of paralysis, and there is hope for patients in knowing that the medicine and treatments available will only get better. If you or someone you know is a victim of paralysis or spinal cord injury due to a vehicle accident, car accident, slip and fall accident, medical mistake, or another type of accident, and you feel as though the injury could have been prevented, you should consider talking to an attorney at Foran & Foran, P.A. The legal information on this site is not intended to be legal advice. Contact one of our experienced Medical Malpractice attorneys or lawyers today to get specific information and answers for your specific situation.